GVGMall is a trading platform for virtual services that provides its users with high-quality services of online games, software and all kinds of virtual goods. Now, it’s easy, comfortable and especially safe to get your favorite game, software or your favorite product at the best quality services. 20% discount on all Software products if you use the code UP at checkout . Here are the best deals that GVGMall highlights for you. old PC with nothing else than a license key that will help you unlock all the goodies and advantages featured in Windows 10 Professional. 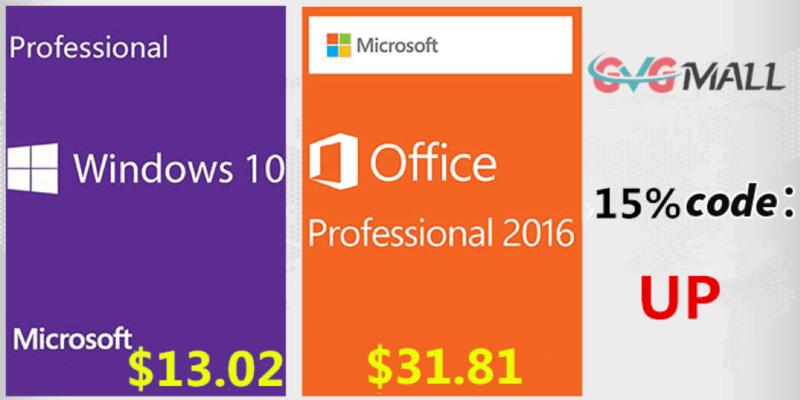 Usually, the license keys for Windows 10 Professional are about $15.32, and now you can apply for a 15% discount. All you have to do is use the code UP when you’re checking out, and you will enjoy your Windows 10 Professional OEM key for only $13.02. Download Windows 10 Pro from Microsoft and install it on your computer, then make sure to activate the copy using the OEM license that you just purchased. If these offers are not enough to convince you, take a look at GVGMall’s four main features that they are proud to flaunt: Secure Payment, Service Guaranteed, 100% Refund Guaranteed and fast delivery. You’ll enjoy the safest payment environment and fast delivery service. There’s also a 100% refund guarantee and 24.7 live support which kill everyone’s worries. Make sure to start the year with some pretty discounts with the best software. Check out more details on the official GVGMall website.